Lance Morcan done a wonderful job with James Morcan on this book. 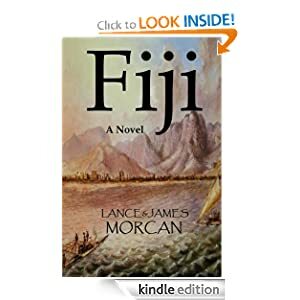 Fiji: A Novel is a wonderful book. This book is filled with action, love, loyalty, and many other things. Susannah Drake and her father set out to do missionary work at a tribe in Momi Bay. When they are out the night before leaving for Momi Bay, Susannah meets a tradesman named Nathan. She cant figure out why she can’t get him out of her mind, and he can’t figure out why he can’t get her out of his mind. When the village is attacked the second time, Susannah’s dad is killed in the middle of her abduction. Nathan will not give up until he rescues her. This book was a gift from Lance Morcan for my honest thoughts. You can also find more information on both authors on Amazon! Printed Book Giveaways for Sea Fangs and Devil’s Manhunt!